BOAC, Marinduque – Marinduque State Colege-School of Community and Health Care (MSC-SCHC) headed by its energetic dean, Marvin P. Plata together with the program heads and faculties administered the pinning ceremony and recognition day with the theme, Future Global Nurses and Social Workers, One Heart, One Soul: Serving, Caring and Leading towards Holistic Change and Transformation at MSC Audio Visual Room on Tuesday, May 8, 2018. 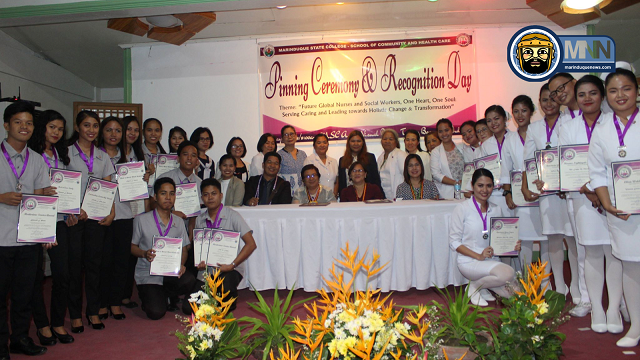 Graduating students from the Bachelor of Science in Nursing (BSN) and Bachelor of Science in Social Work (BSSW) was inspired and challenged by two eloquent speakers, Florinda C. Cabatit a registered nurse and Flordeliza N. Escultura a registered social worker. Meanwile, in the absence of MSC President Dr. Merian P. Catajay-Mani, Dr. Verna Liza L. Capiña persuaded the graduating students with her rhetoric’s on a globally competitive servant of the community and the people as she delivers her challenging and encouraging words. John Mark G. Forcado is a junior correspondent of Marinduque News Network and currently working as media representative at Marinduque State College-Office of Media and International Affairs. He is a former regional coordinator of College Editors Guild of the Philippines Southern Tagalog. JM is a native of Odiongan, Romblon.